The Vancouver Condo Buzz » SPECTACULAR PROJECT! The Amazing Brentwood Burnaby Condo Master Planned Community by Shape Properties located at the Brentwood SkyTrain Station > Massive Burnaby Amazing Brentwood Development Launching! SPECTACULAR PROJECT! The Amazing Brentwood Burnaby Condo Master Planned Community by Shape Properties located at the Brentwood SkyTrain Station > Massive Burnaby Amazing Brentwood Development Launching! 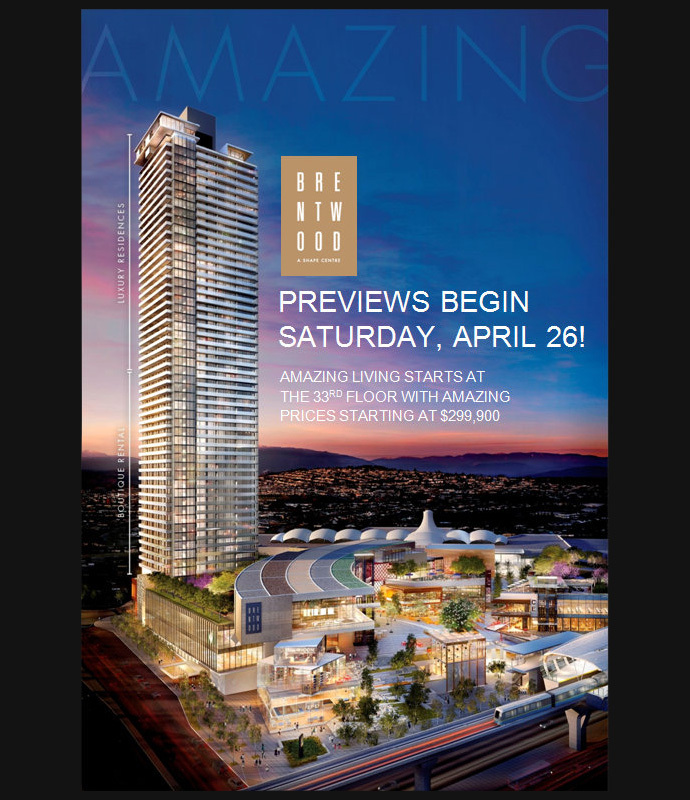 “AMAZING” simply does not do this preconstruction Burnaby real estate project any justice. The 28 acre master planned community called The Amazing Brentwood Burnaby will be a huge undertaking by one of the top developers in Canada and will bring a completely new and rebranded neighbourhood full of energy and promise. For those who have read articles online about the preconstruction Burnaby Amazing Brentwood condo project will know that this master planned neighbourhood will not only launch rental and market housing, but also amazing retail space, new restaurants, grocery stores, services and office space. In addition, The Amazing Brentwood Burnaby master plan will also be within seconds to local transit routes including the SkyTrain Line. The most current news is that the first tower at The Amazing Brentwood by Shape Properties will be launching in Spring 2014 and is not what everyone is expecting. The ultra affordable Burnaby Amazing Brentwood condos will be well priced for this market place and will be ideal for various lifestyles including professional singles to investors and to families of all sizes. Whether you are an upsizer or a downsizer, The Amazing Brentwood Burnaby condo tower in phase one will provide you with a wealth of different floor plans to choose from, each with its own advantages, views and finishing palettes. In addition, Phase 1 at The Amazing Brentwood by Shape Properties will feature approximately 591 residences of which around 300 (or half) are intended to be purpose built rental Burnaby condos operated and owned by Shape Properties Corp and their funding partners. The Brentwood Mall is actually owned by Shape Properties, which applied for rezoning of the 28 acre mall site to allow for an impressive and landmark 53 storey high-rise tower on top of a 3 storey podium (for commercial use). Phase 1 The Amazing Brentwood condo tower will be located at the site’s southwest corner. The striking modern architecture is by James K.M. Cheng Architects. More information is below. The Amazing Brentwood from Shape Properties on Vimeo. PREVIEWS BEGIN APRIL 26! AMAZING BRENTWOOD CONDO LIVING STARTS AT THE 33rd FLOOR WITH AMAZING PRICES STARTING AT JUST $299,900! BEFORE YOU BUY ANYWHERE ELSE, YOU HAVE TO SEE THE AMAZING BRENTWOOD! Are you ready to experience what will be the largest and most impressive new urban community in North America? As the most ambitious and impeccably designed community in Metro Vancouver, Brentwood is the future of living and investing. With integrated transit, 28-acres of shopping, dining, and entertainment right below you, and the most distinct homes in the city – it is nothing short of amazing. Not to mention it’s the best value in Metro Vancouver. OUR VIEWS START WHERE OTHERS LEAVE OFF! At The Amazing Brentwood, home ownership starts on the 33rd floor – which means that every home comes with a panoramic penthouse view. At no extra cost. OWNERSHIP STARTING FROM $299,900. 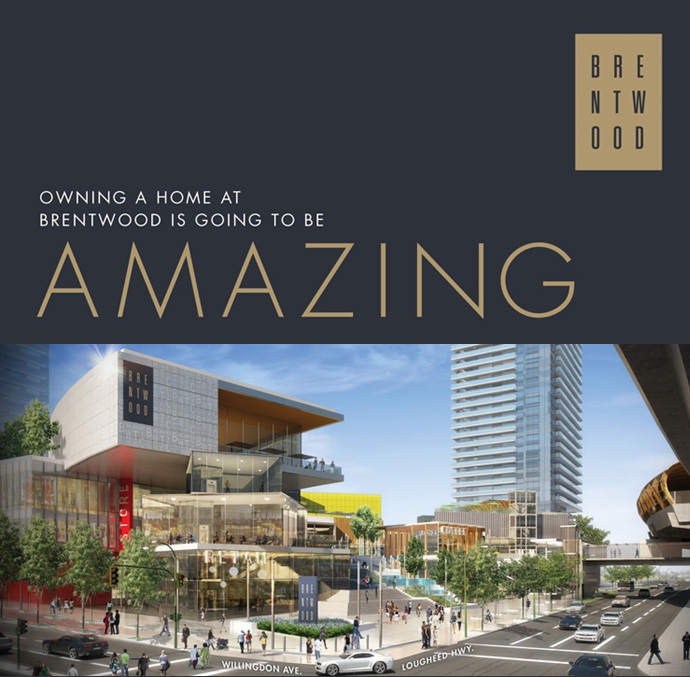 We don’t take it lightly when we say that The Amazing Brentwood is going to be, well, AMAZING. It’s not just the 28-acre master-planned community with SkyTrain directly onsite. Or the one-acre event plaza with year-round entertainment. Or the 350+ shops, services and restaurants. Although that definitely IS all pretty amazing. There’s a whole different level of amazing that can only be found in the homes at Brentwood, themselves. There’s our braggable kitchens. Our oversized balconies that come with every home. Our 20,000 sf of residents only amenity space. And of course, our unbeatable, unobstructed, panoramic views. We can’t wait to tell you more and look forward to walking you through our 15,000 sf Presentation Centre and three amazing Show Homes very soon. We promise you, it’s worth waiting for – because it’s going to be AMAZING. Home ownership at Brentwood ONE starts on the 33rd floor and soars up to the 63rd floor, giving every resident unobstructed, panoramic views in all directions. Whether you prefer to take in the morning sunrise, gaze upon mountain peaks, or watch the setting sun glimmer on the Burrard Inlet – every home at Brentwood will feature views that will take your breath away. HOMES FROM $299,900 PREVIEWS BEGIN APRIL 26! Amazing planned community. Amazing view homes. Amazing new shops. Amazing event plaza. Amazing transit access. Amazing energy. For more details about this amazing development, please register your interest online at www.theamazingbrentwood.com or on this page and we will forward you any new launch information we receive! If you are looking to invest or purchase a new condo in Brentwood Burnaby this year, The Amazing Brentwood condos will be the best and most exciting development for 2014! The Amazing Brentwood Burnaby condo development will be the most ambitious, impeccably designed community in Metro Vancouver. With a one-acre public plaza, walkable streets, parks, shops, cafes, entertainment zones, and direct SkyTrain access all just an elevator ride away – The Amazing Brentwood condo community has been envisioned as one, unparalleled integrated experience by some of the city’s most experienced and sophisticated professionals. It will be a place that everyone will be proud to be a part of. Congratulations on being part of something AMAZING! Not only is The Amazing Brentwood at Lougheed and Willingdon Burnaby the future of mixed-use living, but it’s also the best investment in Metro Vancouver. As a VIP registrant, you will be the first to receive any updates or information about the largest and most impressive new urban community in North America. Nowhere else is a project this significant taking place. Over the next few weeks, we will introduce you to the 8 WAYS THE AMAZING BRENTWOOD DELIVERS TREMEMDOUS VALUE. From the SkyTrain, right at your doorstep, to the 28-acre shopping, dining and entertainment district, to the intelligent interior design. Our team is working hard to get the 15,000 square foot Presentation Centre & Show Homes ready for our spring opening. We want you to be the first to get in and will be in touch as soon as our dates are confirmed. From the web site: Amazing Master-plan. Nowhere else in North America is a project this amazing taking place: a 28 acre site is being entirely re-imagined as a residential neighbourhood atop a premier shopping and entertainment district. The all-new Brentwood is going to be envied – without question. Step off the SkyTrain platform and experience an extraordinary sense of arrival to The Amazing Brentwood Burnaby condo community. The doors open into the social heart of the community: an amphitheater of activity and a lively public plaza. From there, you can take in the rest of the visionary new Burnaby Amazing Brentwood community: 350+ coveted shops, outdoor festivals and markets, a pedestrian feel with wide boulevards leading to quaint sidewalk cafes, and high-end condominium residences with beyond-amazing views in every direction. Amazing New Shops. The Amazing Brentwood will be home to more than 350 shops and services dedicated to global brands, specialty retailers, restaurants, markets, cafes and more. 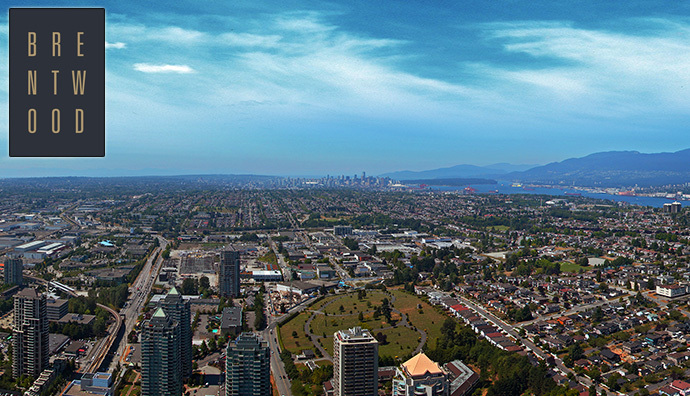 An enticing destination from day to night, and conveniently connected to SkyTrain, Brentwood will become the vibrant centrepiece of Burnaby real estate district. Call it your home and have a front row to what will become a benchmark for future development. Yes, it’s about to be that amazing. Amazing View Homes at The Amazing Brentwood Condo Towers. Soaring above a shopping destination curated by distinguished tastemakers, Brentwood offers world-class amenities an elevator ride away. Take in sweeping views from the highest residential towers west of Toronto, all masterfully planned in partnership with award-winning architect James K.M. Cheng. These signature Burnaby Amazing Brentwood condo high-rise homes, located directly on the SkyTrain, will form part of a seamless master-planned community unlike any in the region. 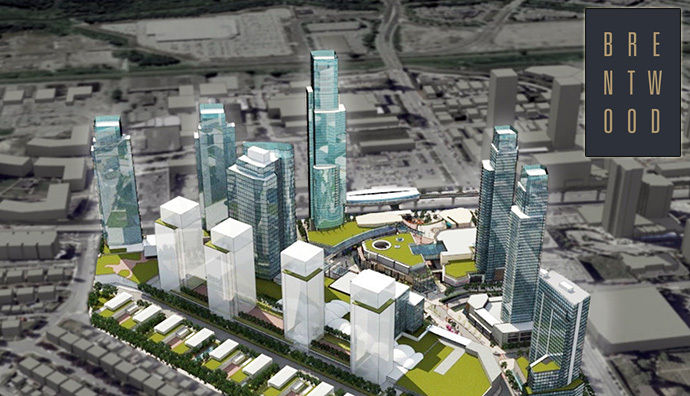 Burnaby City Council approved a new Brentwood Site Conceptual Master Plan back in September 2013 which allows for the construction of towers up to 70 storeys in height. Hot on the heels of this new approval, The Amazing Brentwood by Shape Properties announced a huge master planned development that will revitalize the under utilized but very central Brentwood Burnaby real estate district. 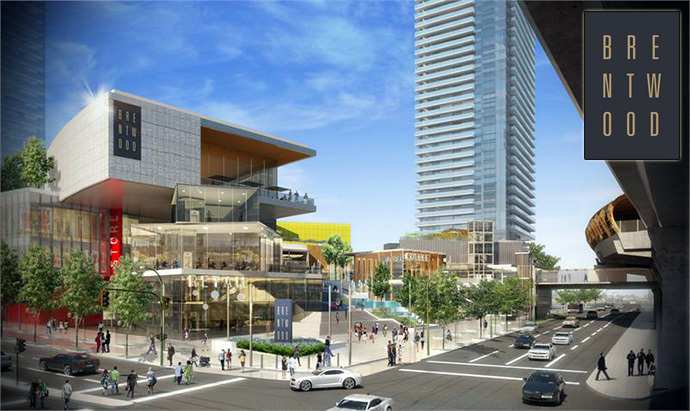 The second reading for the rezoning of this site was also approved by City Council, thereby allowing Shape Properties to add commercial space, underground parking and even a multi-level Central Civic Plaza connected to the Brentwood SkyTrain Station at The Amazing Brentwood Burnaby condo development site. The overall goal was to create a new and vibrant city centre community with all amenities, services and transit literally at your front door. 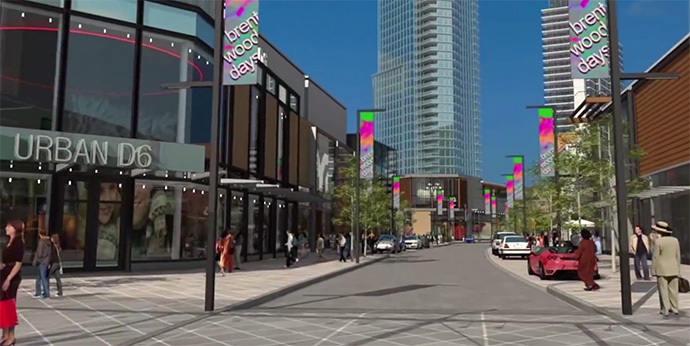 The entire master plan for The Amazing Brentwood by Shape Properties will add 350 new shops and restaurants to the Brentwood centre’s site and will include ten Burnaby towers including two office towers between 30 to 40 storeys tall and a 50,000 square-foot grocery store. The remaining Burnaby Amazing Brentwood condo towers will be residential with up to 4,200 units to house as many as 8,400 people and will include both rental and strata owner occupied residences. 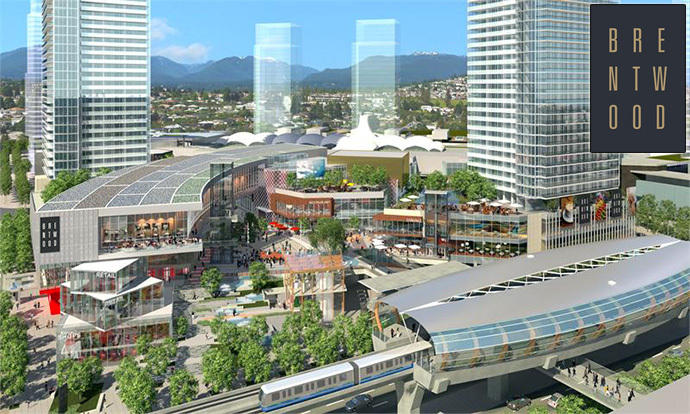 The Amazing Brentwood Phase 1 at Willingdon & Lougheed Hwy will also showcase a 1 acre public plaza for outdoor events. 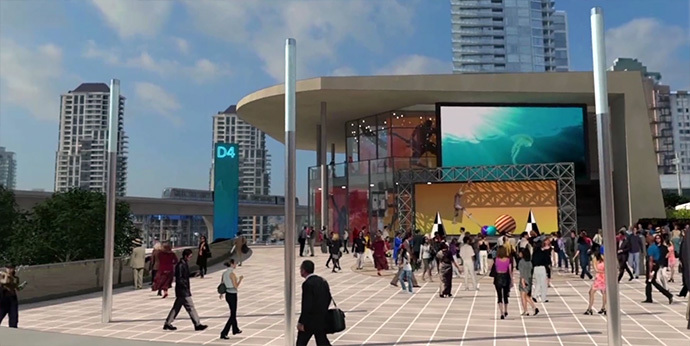 The master plan will likely take up to twenty years to complete and the 1st tower is estimated to complete in late 2017. According to the proposal, Shape Properties would launch the 1st high-rise tower residence in Spring 2014 and will be located at the corner of Willingdon Avenue and Halifax Street Burnaby. The Amazing Brentwood Phase 1 tower will be atop a commercial podium and will also feature two separate entrances (one for owner occupied homes and one for rental suites) and lobbies that will have concierge/security desk at the front. The Phase 1 Burnaby The Amazing Brentwood rental suite lobby will face Willingdon Avenue whilst the owner occupied homes will be serviced through a grand entrance lobby along Halifax Street. The landmark first tower at The Amazing Brentwood will see the design and construction of a 3 storey commercial podium (with office space and ground level retail) with the first floor of the high-rise (on top of the commercial podium) an amenity floor for both the rental and market suite owners. The Burnaby condo amenities will likely include 2 professionally designed and furnished guest suites for overnight and out of town guests, a clubhouse lounge, kitchen and dining room as well as a media and games room. The amenity floor will also feature a state of the art fitness gym. The next 25 floors up in Phase 1 The Amazing Brentwood Burnaby high-rise tower will feature rental units that are owned and operated by Shape Properties and their partner. As part of the commitment to offer affordable housing, the rental component was essential in the proposed revitalization of the 28 acre site. The Burnaby Amazing Brentwood rental suites will range from 1 bedrooms to 2 bedroom plus den floor plans, giving plenty of variety for singles to couples to families. As well, The Amazing Brentwood Burnaby rental one bedroom suites will range in size between 539 and 557 square feet, which is in-line with strata owner occupied floorplan sizes. The 2 bed + den floor plans will range in size between 881 to 895 square feet. As part of the proposal, The Amazing Brentwood rental one bedroom suites will include 125 residences and there are approximately 25 two bedroom and den rentals. There’s also dedicated parking underground for the rental condo tenants serviced by a high-speed elevator to their units. The upper 27 floors of the first tower will be featured at strata condominiums. The expected offering will include 105 one bedroom suites around the same size as the rental layouts (mid to high 500’s). However, the high end of the range are family sized three bedroom floor plans that range between 1723 to 2819 square feet which are ideal for families. The Amazing Brentwood Burnaby condos will also feature at least 30 ‘adaptable units’ which will be complimented with 30 handicapped parking stalls. There will also be 328 parking stalls in the underground for owner occupied suites. The public hearing for The Amazing Brentwood Phase 1 tower will be held Tuesday, February 25 at 7 p.m. in Burnaby city hall council chambers.